Today we re-visit the service guy and inveterate restaurant critic, namely me. This weekend has been one of wanton indulgence, indulgence that included two fine dining meals, a hot tub and a custom massage. 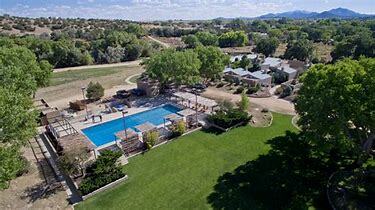 It’s not the way we conduct our lives most weekends but, courtesy of a gift certificate we bought at a benefit auction for the Taos Historic Museums we found ourselves at Sunrise Springs Spa Resort in La Cienega just south of Santa Fe for the weekend. Think of it as $650 of goodness (room and breakfast for two days) for the winning bid of auction price of $400. Not cheap to be sure but quite fair considering the amenities. Because Peggy had to have her windshield replaced, we suffered through two-hour wait and an unremarkable New Mexican fast food meal at El Parasol a couple of blocks from Safelite. Peggy was unimpressed whereas I was relieved that didn’t have to eat my shoe. 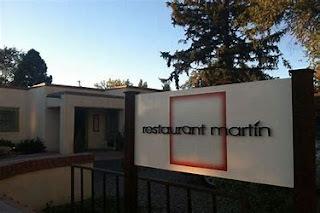 With amazing foresight, we had made reservations at our current favorite restaurant Martin at the corner of Galisteo and Paseo de Peralta. In 2017, the last time I reported on the place, Martin and it’s owner Martin Rios had been nominated as Best Chef Southwest by the James Beard Foundation, the only restaurant in New Mexico to receive the honor. In 2018 Restaurante Martin took home First Place. Saludos to Chef Martin and his wife and partner Jennifer. On this occasion Jennifer was a warm presence throughout the evening as she delivered food and touched tables. Touching tables is the waning practice of the owner or manager visiting every table to show appreciation for your patronage. It matters. A lot. Julian from Chihuahua was our engaging and skillful server. And to that subject I must proselytize on the importance of casting servers and bartenders. I call it casting because the great ones walk in with the tools and attitude they need. You can help them with rote knowledge like using the cash register and knowing the menu but the great ones are born with IT. I observed that Julien was serving the entire dining room which as active but not full. It’s not a staffing call I would make but with Jennifer delivering the food as needed, he never broke a sweat. I also calculated that he was going to walk with $300 or more for his efforts. Maybe much more if he turned the tables another time. We were blessed by a total pro at Sunrise Springs on Saturday night, too. Chris, a native New Mexican was affable, knew the menu cold and could proudly describe the food and the ingredients and tell us where they were sourced. The greens and vegetables come Ojo Caliente’s farm and garden. Sunrise Springs is the sister property to Ojo Caliente. I ordered the Filet of Ribeye despite having never heard of that cut of meat. If the cut was anywhere in proximity to my beloved ribeye it had to be good. It was flavorful and cooked rare as ordered but as tough as the aforementioned shoe. I did not complain but asked Chris, “What the heck is a Filet of Ribeye. He explained that it’s the cut of that that covers the ribs. Methinks that Chef Rocky Durham has taken liberties in renaming the lean, fatless, firm flap steak that is often sliced for fajitas. Nice try, Rocky. I like a low food cost as well as the next person, but I needed chain saw to cut the thing. At speaking of near misses, Sunrise Springs was full of shortcomings big and small. It clearly aspires to lofty things but falls short here and there. On the conceptual level, it needs a lobby and a gathering place to have a glass of wine. Ideally, that would be adjacent to the restaurant though it’s not clear how they can pull that off. We were disappointed not to be able to have a beverage before dinner and were relegated to opening a bottle of Sauvignon Blanc in our room. The house lost the sale and we didn’t have the social scene we would have preferred. In fairness the resort does have al fresco drinking in the warm months but it’s serious oversight when the high is 30. Then there are small things like not serving a soup spoon with porridge. One assumes they would provide a larger spoon with soup. What not oatmeal? Then back to the big picture. Being different for its own sake is not enough. It only works if different is better. How is it even possible that breakfast menu doesn’t have a single omelet and when it did it was ham and cheese? Is it breakfast if you can’t get bacon and eggs? Really? Does the porridge have to come with coconut milk? Does the green chile have to be so hot only a fire-eater can swallow it? Our Sunday breakfast, the one with the porridge, was marred by a spilled ramekin of maple syrup that ran all over Peggy’s coat, chair and table top. The bus boy made a middling effort to clean up his mess. But the mishap was deftly handled by Ben, the manager, who gave us his heartfelt apology and offered to make it right, hinting at a free meal down the road. We told him it was very much appreciated but unnecessary. Moments later we saw Ben walking toward the front desk where we deduced that something was afoot. When we checked out some five minutes later, he had comped the previous night’s dinner. We were so surprised and impressed that we went back to the restaurant to express our thanks. I told Ben that I had been in the business and that he had gone above and beyond in handling the awkward situation. I offered the theory that “You can’t lose a customer if you give a damn.” and he was evidence of that. Further, I suggested that dealing sympathetically and genuinely with an aggrieved guest can make a guest for life. That's called ending on an up note and we will return. 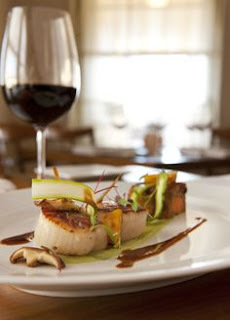 You have probably thought about being a restaurant critic and this seals the deal. You should. 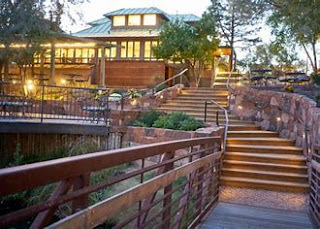 Restaurant Martin' will now be on our list of places to go in Santa Fe. The food photograph is gorgeous, regardless of where it was taken, and your humor in describing Sunrise Springs, which has struggled a bit, is fabulous. Love the fact that you said you were relieved you did not have to eat your shoe. Been there. Glad Ben made up for the errors. I also suspect you had a nice massage and hot tub soak. Not a bad weekend, all in all. Food and the restaurant business is in your blood. We look forward to more reviews!